For Repay The eNett Way 18 wonderful people at eNett are riding 250km,150km,100km or 50km. What is Repay the eNett Way? Repay The eNett Way is eNett’s social corporate responsibility program. Each year, we focus on a key travel destination that is affected in some way by the growth of tourism. This year, we’ll focus on helping underprivileged communities in Nepal. 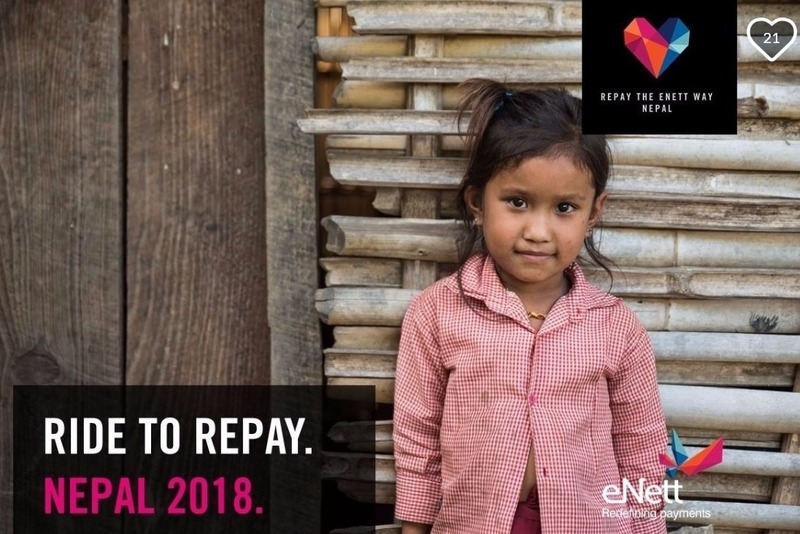 The objective of Repay The eNett Way is not just to ‘give’ to a charity, but to educate, inspire,equip and support the charities we work with to build a better future for their communities. Providing sufficient places for education and community businesses will help meet that aim. Nepal is an iconic travel destination and travel contributes US$1.6bn to its GDP. Tourism also provides foreign currency to boost their trade between other countries and is now one of Nepal's biggest earners of foreign income. However, it can also lead to overcrowding and strain on infrastructure. eNett will be sending 8 volunteers to Nepal to work on two projects with THISWORLDEXISTS. The first project will focus on building a new block of classrooms for the Sindhu Primary School, in a small village in the Tanahun region of Central Nepal. The second project of the trip will include a visit to The Palu Bari Women’s Educational Facility (Palanchok Bagawati Women’s School) - An existing THISWORLDEXISTS project in the Sankhu district of Nepal, located about an hour and a half drive from Kathmandu.